As announced last year we’ve started a new monthly, live broadcast over in Berlin on the excellent BLN.FM – the city’s finest non-profit radio station (and I believe Germany’s first station of the kind!). When I say live, the show is being broadcasted live but is pre-recorded. 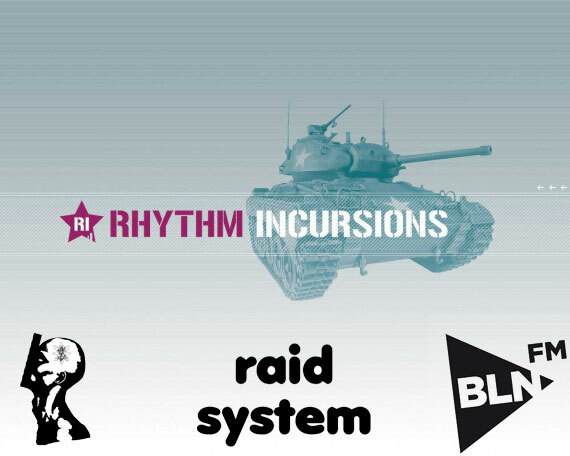 Each month myself (Laurent Fintoni), Primus Luta who helms RIPL and Raid System (aka XLII and Broken Haze) who helm RIRS will take turns in curating the one hour mix/playlist and each show will be presented by myself in regular Rhythm Inc fashion running down artists, releases and related info. The flavour of our new BLN.FM shows is slightly more dancefloor than our regular shows here (aside from RIRS) so expect plenty of delicious dance related musical treats over the next twelve months. Each monthly goes out on the first Tuesday of the month live on BLN.FM from 7PM CET (which is GMT+1, so please check your local airtime). You can stream it from BLN.FM and each show is archived both on their site and here where we will podcast them a week or so after the air date (we’re bit late this month I know). This first show was curated by Raid System featuring one hour of their favourite dancefloor riddims of the second half of 2011. As always XLII and Broken Haze take in turn to mix 4/5 tracks each. You can download and/or stream the show below as well as view full tracklist. Don’t forget to subscribe to our iTunes/RSS feeds in order to receive all shows automatically. Thanks once more to BLN.FM for having us and enjoy this first show! This entry was posted on Wednesday, January 18th, 2012 at 5:22 pm. It is filed under Podcasts, Presented by Laurent and tagged with Starkey, Om Unit, XLII, DVA, Broken Haze, Africa Hitech, S-Type, Seiji, Klic, Drums of Death, Taz, Yot, QQ, Sibian & Faun, Diamond Bass, GOLD, Turnsteak, Dev79, Swing Ting. You can follow any responses to this entry through the RSS 2.0 feed.